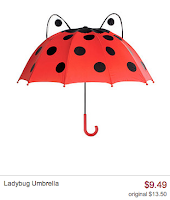 Ann Taylor introduces Little Ann outfit for girls! The limited-edition "Little Ann" outfit, made up of a hand-embroidered top ($78) and a matching silk crinkle skirt ($78) will hit select stores and the company's website next month. The twirl-ready Mexican-inspired outfit – created by Lisa Axelson, Ann Taylor’s head of design and a new mom herself – will benefit St. Jude Children’s Research Hospital, with 60 percent of sales going to the organization. For mamas loving the look themselves, a matching outfit will be available in grown-up sizes, with grown-up prices to match ($128 for the top and $118 for the skirt). Katie Holmes is wearing the grown-up version for the SS'11 Campaign. would be cute to see Suri & Katie in matching outfits! Suri's Kidorable Rain Gear on Sale at Zulily! 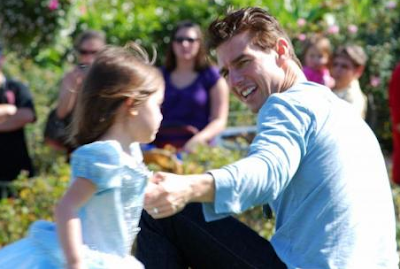 MORE Pictures from Suri's 5th BirthDay Party! While the birthday party seems fairly low-key, Tom is reportedly going to splurge on his little girl. 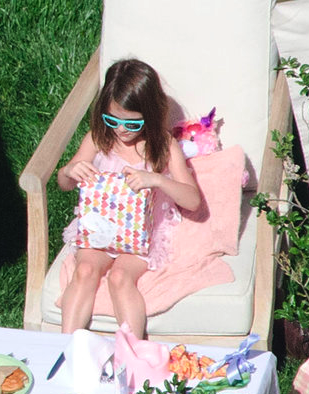 Suri was wearing Popsicle Party Dress SS'11 by Biscotti and Teal Sunglasses by Ray Ban. source: for more pictures, please visit bauergriffinblog! photos above are posted with personal permission from Bauer-Griffin LLC. 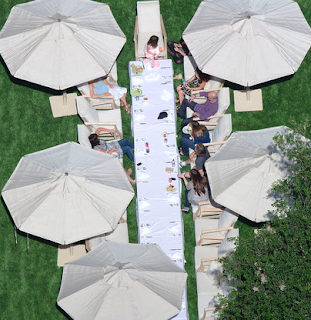 Suri Cruise lounged outside while Katie Holmes sat nearby in LA, on Monday, April 18th 2011. The little one was surrounded by family and friends to open up gifts for her birthday. Suri is wearing her Teal Sunglasses by Ray Ban and Popsicle Party Ruffle Dress by Biscotti. due to the drama & accusations in the comments, the last post was removed altogether. 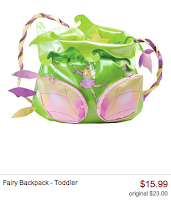 there are posting rules for comments on this blog: no disrespect to other posters, no name calling, no bad English, and keep criticizing of the parenting style to the minimum. Suri is adorable child. I sincerely wish her Happy BirthDay! and anyone who is doubting that, will not be heard on this blog. sorry. for her BD party celebration at their house in CA, Suri was wearing her Teal Sunglasses by Ray Ban and Popsicle Party Ruffle Dress by Biscotti. Happy BD to our Little Princess! April is also a special month for this Blog, as i started it in April 3 years ago! SCFB is about to reach a milestone with 600 FOLLOWERS and 230+ Subscribers! of Little Suri on this Blog! 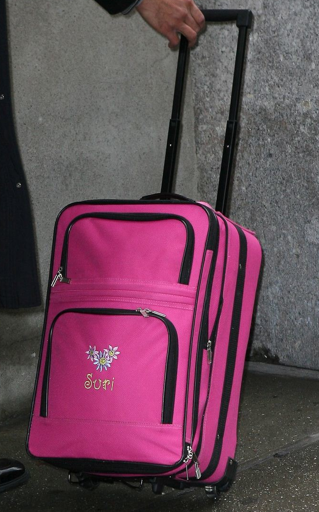 Enjoy this adorable slideshow by popsugar and take a look back on Suri's many travels & fashions! and one more great slideshow by ivillage! 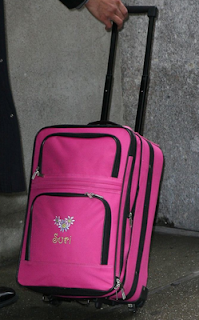 in the evening The Cruise Family were spotted leaving their NYC apartment, Wednesday, 13.
one of the security guards was pulling a Pink Suitcase with "Suri" embroidery. Thanks to Pamela & Amanda! Suri is wearing the same outfits as earlier. 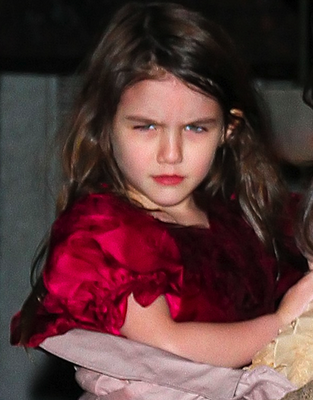 looks like Suri owns most of the FW'10 Collection by Little Marc Jacobs. Judging by the color, from the picture above, i think that Suri is Ruffle Velvet Dress by LMJ. 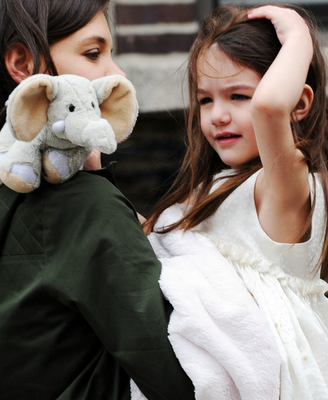 Suri holds on to a stuffed bear as she visits Dylan's Candy Bar in NYC on Wednesday, 13. Suri is wearing White Coat by Burberry. 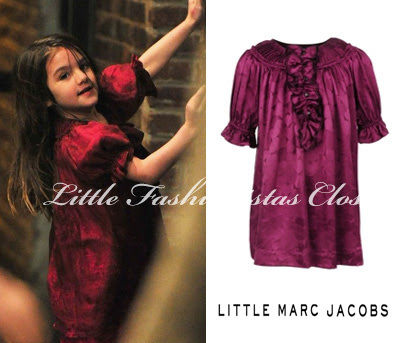 Suri is wearing Purple Sketch Ballet Shoes from FW by Little Marc Jacobs, yesterday Suri also wore a dress by Marc Jacobs! 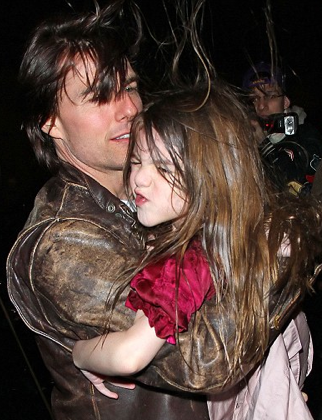 Suri, along with TomKat, went out for dinner to Il Cantorini restaurant in NYC on Tuesday, 12. 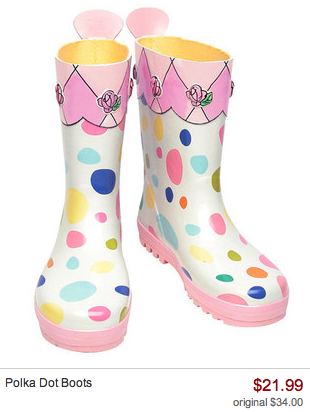 Suri wore Pink UGG Boots, which she first wore on December 17th 2010. 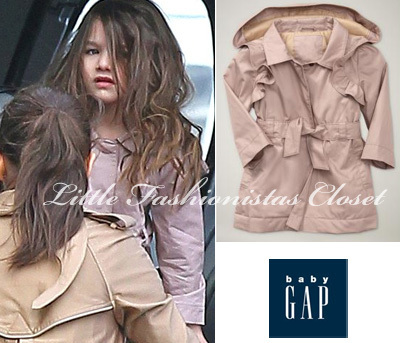 Suri is wrapped in Ruffle Trench Coat by GAP, which she first wore on March 11th 2011. 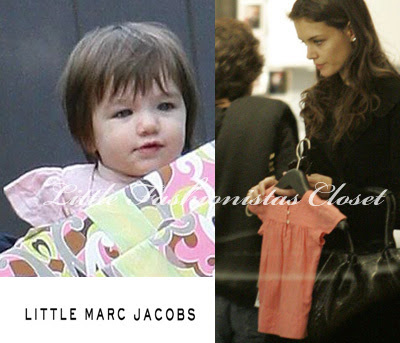 Katie was pictured buying this little Pink Flutter Dress from Marc Jacobs store in Beverly Hills, December'06 and in April'07 Suri wore this dress wile attending Grier's BD party at Brook's Shields house. unseen pictures from March 10, earlier in the day S&K were running more errands. 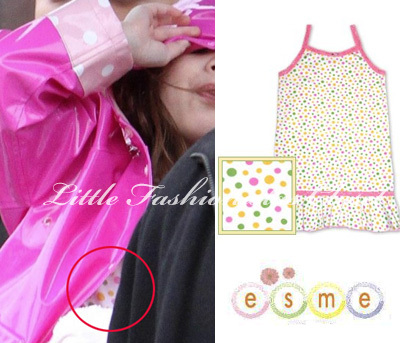 now i can confirm that Suri was wearing that Pajama Gowns by Esme on that day. Thanks to Natalie for the picture! Tom Cruise and wife Katie Holmes plan to splash out £13,000 on a CIRCUS for daughter Suri's fifth birthday party. There will be elephants and giraffes parading at their £21million home in Beverly Hills, California, on April 18. 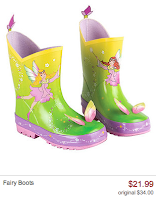 And actors will be dressed up as characters from Suri's favourite book, Alice In Wonderland. A pal said: "Suri loves Alice so they're going to deck out their home exactly like the fantasy. They want to make it extra special for her." David and Victoria Beckham, who live nearby, have been invited to take their three sons along. 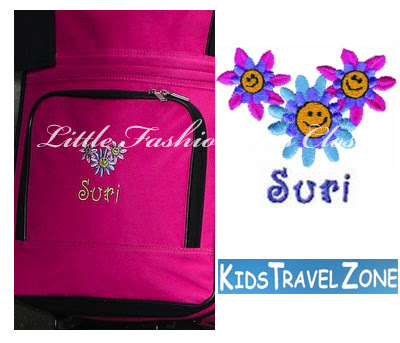 Suri is a Party Planner! Katie is super busy promoting The Kennedys and she stopped by Jimmy Kimmel Live Show on Tuesday, April 4. 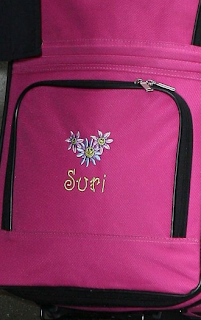 "Suri's Birthday is my favorite day of the year. And i like to dedicate April to her. Its a Big Day." She really helps to plan her party. She wants her friends to come over for a summer party and we make lists and we have meetings, and she picks out things, and she wants to make the cake together and we frost it together. We are going to do it together!" Suri Cruise may be the most indulged child in Hollywood, so it's no surprise that her mother Katie Holmes is planning a rather lavish affair for her upcoming 5th birthday. Speaking on a Ryan Seacrest's US radio show on Monday, Katie, 32, said: 'Suri's turns five in about two weeks.